LAWRENCE — A thorough test of engineering skill and precision – while racing the clock -- will be on display this week at the University of Kansas. A team of civil engineers from the School of Engineering will compete in the American Society of Civil Engineering (ASCE) Mid-Continent Regional Conference steel bridge competition, set for 8 a.m. to 5:30 p.m. Friday, April 24, at the Lied Center. KU plays host this year to the three-day ASCE Mid-Continent Regional Conference for the first time since 2007. More than 400 participants from 15 universities are expected on campus for a variety of competitions, presentations and social events today through Saturday – April 23-25. 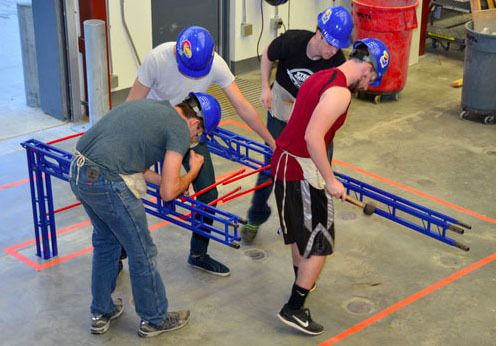 KU’s steel bridge team is hoping for a top-three finish at regionals, which would qualify it for the national competition for the second time in the past three years. Teams are challenged to construct a bridge with a decking surface that sits at a minimum of 1 foot 6 inches and a maximum of 2 feet 7 inches along with an overall bridge height restriction of 5 feet. The bridge must also span 19 feet, support a minimum of 2,700 pounds and withstand a lateral strength test of 50 pounds. Teams can earn additional points by addressing a variety of factors such as reducing the weight of the bridge itself, assembling the bridge more quickly, using fewer team members to construct the bridge and increasing the stability of the bridge under heavier loads. Judges will also score teams on how they formally present the strategy and logic behind their design. “The idea is to create a bridge that goes together extremely quickly and maximizes light weight with minimum deflection,” said Jacob Cocke, steel bridge team captain and a senior in architectural engineering. KU’s bridge this year features a more elaborate and decorative design. It’s a strategy that team members picked up last year when they attended the national competition, strictly as observers to plan for hosting this year’s regional competition. The overall experience provides students with a variety of learning opportunities. In addition to Friday’s steel bridge competition, a concrete canoe, concrete bowling and geowall contest will take place from 8 a.m. to 4 p.m. Saturday, April 25, at Lone Star Lake, 10 miles southwest of Lawrence. See the full ASCE Mid-Continent Regional Conference schedule. In addition to KU, other schools competing are Benedictine College, Kansas State University, Missouri State University, Oklahoma State University, Oklahoma State University-Institute of Technology, the University of Oklahoma, Southern Illinois University-Carbondale, Southern Illinois University-Edwardsville, St. Louis University, University of Arkansas, University of Missouri, University of Missouri-Kansas City, University of Missouri Science and Technology, University of Nebraska and University of Nebraska-Omaha.